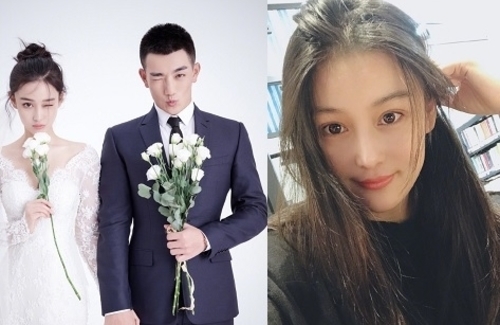 Since Chinese actress, 31-year-old Viann Zhang Xinyu (张馨予), broke up with Fan Bingbing‘s (范冰冰) current boyfriend, Li Chen (李晨), she’s moved on and married an active duty officer, He Jie (何捷). Having met on the Hunan TV special program, Dog Partner <奇兵神犬>, the two’s sudden marriage last August after dating for half a year inevitably stirred up pregnancy rumors. Sure enough, her baby bump could no longer be concealed two months after tying the knot. As the baby’s expected due date is approaching, a Chinese netizen allegedly spotted Viann in the hospital, and she reportedly already gave birth to her daughter. The netizen claims she encountered Viann in the Obstetrics and Gynaecology department of a military hospital in Guangzhou, where Viann moved to with her husband. Viann is supposedly staying at the VIP ward – priced at 40,000 RMB – and already delivered her daughter safely. An official announcement is expected soon, however, the star’s staff told the Chinese media they are not aware of the situation. If it is true, that explains why Viann has not updated her Weibo since the 17th. Her last post was a pretty selfie of her eating cake. Since moving to Guangzhou, the actress has been focused on caring for her pregnancy at home. Sometimes, the couple is photographed shopping together. Although the news of the delivery has not been confirmed, fans are awaiting Viann’s announcement in anticipation. 1 comment to Viann Zhang Spotted in the VIP Ward, Already Gave Birth?